God's Grace Overflows: Canning Time! Hello All! I have been away for the summer and now its time to get back into the swing of things. I'm making some changes to my original blog and am going to focus on some of the desires of my heart. FOOD and lots more COOKING! I was going to change the title of my blog and decided I was going to stay with God's Grace Overflows, because his LOVE does overflow-even in the Kitchen! So, when I find a good recipe to share or an encouraging word- You will be the first to hear about it! Okay, I have been busy! My mother-in-law Roxy and I have been learning to use a Pressure Canner to of course can meat (above) and we have been having a blast at trying it. 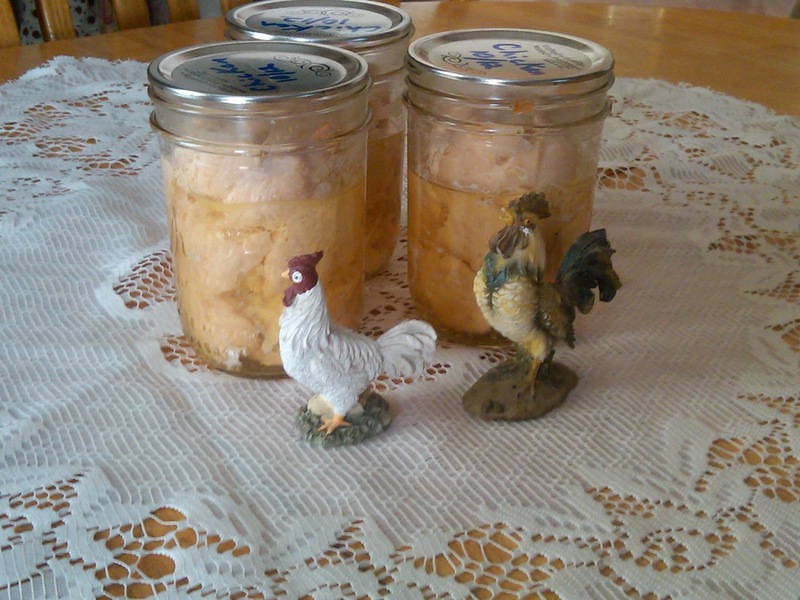 Once we got passed the fear of the canner and completely running out of water while in the process of canning, we have finally got some Chicken canned! Yeah!! We also went to a Pressure Canning class at our Extention Office last week and we learned all the do's and don'ts of canning. We got a few red marks from the class, but at least now we are able to can without worrying about if we did it right or not. We are hoping to get some more chicken canned along with some pork and beef. I try and buy what ever is on sale for the week and then can what we can from the freezer. I'm excited, can't you tell? I am a very frugal mom/wife and what ever I can do to help cut the cost of my grocery bill the better. And, just in case you all haven't notcied but the groceries are continuing to rise in price! So, if the Lord shows you something to purchase to make your life a lot simpler in cooking and preparing for tough times ahead, DO! I'm one that has a notebook full of differnet kind of recipes, any where from making homemade vanilla to sweetened condensed milk. It's always nice to have those neat little things written down, just in case we ever needed to make them ourselves. I just encourage all women to be creative in your kitchens and explore the desires of your hearts! Hooray, so glad your back! Your post is really lovely. Just keep on blogging.It will be so much fun to see your post on your love of cooking! Now that is one thing I have never canned - any kind of meat. I can many other things but never meat. I have a pressure canner and would like to try it sometime soon! Oh I LOVE all your doings Amy!! I wish SO bad I could come over and learn from you! You and Roxy are so much fun and you two sure encourage me so much!! I love that you both are canning like crazy. I just got a pressure canner but have been afraid to use it. I need to get to it and now I especially want to after seeing your beautiful picture above of your canned chicken!! Lol Amy, I just went to my blog and found your delightful comment, right after I left mine. We must of both been thinking about each other at the same time!!! So excited that we both can encourage each other in the blogging world! You are such a delight! His love does overflow even in the kitchen.... Sometimes I really need it to overflow in the kitchen around her hehe (especially after all those "red marks" we got.. hehe). Great post Amy... look forward to others.